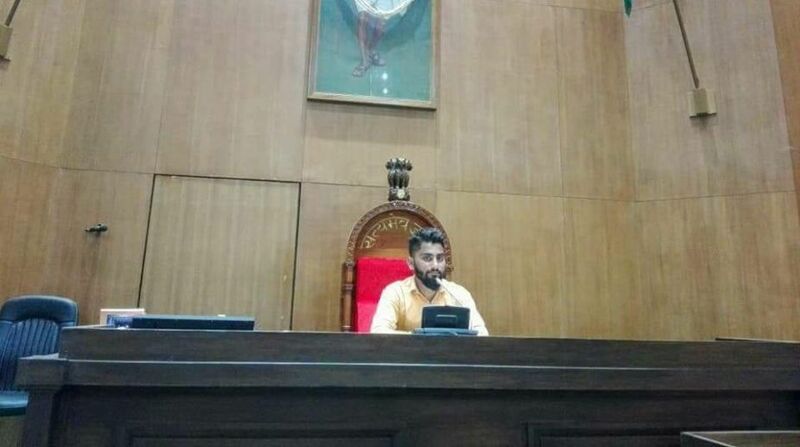 A probe has been ordered after pictures of a young man sitting on Speaker’s chair in the main hall of Gujarat Assembly went viral on social media. Speaker Rajendra Trivedi on Tuesday ordered an inquiry, said Assembly secretary D M Patel. “No one except the Speaker can sit on that chair. It is also a matter of security breach, because only authorised persons and legislators are allowed to enter the main hall. The speaker has ordered an inquiry,” Patel said. “The Assembly Secretariat has started the probe to find out how that man managed to enter the hall and click pictures….We may hand over the probe to police after finishing the inquiry,” Patel added. Screen shots of a WhatsApp group which went viral on social media last week identify the man only as ‘Rahul’. The photos suggest that he entered the hall (along with another person who possibly clicked the pictures) when the Assembly was not in session, as no one else is seen in the hall. One picture has him sitting on Speaker’s chair. In another, he is sitting on an MLA’s seat. He has also clicked a selfie with the empty hall in the background. The pictures started doing rounds soon after the Budget session ended on March 28.